*Cuba Gooding, Jr. is Eugene Brown in the remarkable film, “The Life of a King,” based on the real life of the Big Chair Chess Club founder. In prison 18 years for bank robbery, Brown learned how to play chess. After his release Brown’s motto of “Teach the un-teachable, reach the un-reachable, and always think before you move” saved the lives of many doomed youths. The Film Strip caught up with Gooding and writer/director Jake Goldberger recently at the Soho Grand in New York City. Gooding gives a lowdown of his newest release, the Oscars and the ‘Blacks don’t sell overseas’ stigma. Cuba, what makes this character special to you? 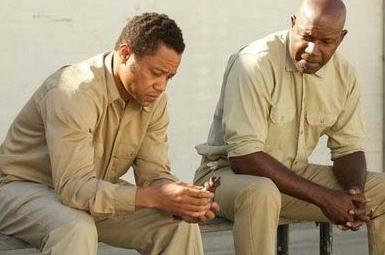 CUBA GOODING, JR: There are a few criteria on which I choose for the roles I gravitate towards. One would be military. I like military movies but I also like real life people that reflect how America became the great nation that it is today. Just look at ‘Men of Honor,’ Chief Carl Brashear, and the Tuskegee Airmen movies. I think the third thing is the father and son nucleus in the family. You look back at ‘Boyz n the Hood,’ with Tre and Furious, even ‘The Butler’ there’s that relationship with father and son. When I was growing up my father was on the road and all my other buddies’ fathers were gone. It was the mom that raised us and turned us into men, but it pushed me to wanting to be in the life of my sons. All of those things coupled with the fact that when I was going to high school I didn’t know about Tuskegee Airmen or the other [black heroes] in the pages in Black history. And I damn well didn’t know about prison inmate Eugene Brown who taught some kids in the inner city how to play chest hat became Grand Master chess champions. JAKE GOLDBERGER: At one point my producer and I sat down with some financiers and they said we love the script, we love the story but what about making Eugene Brown white? My producers and were like, ‘have a nice day!’ It was right after ‘The Blind Side’ with Sandra Bullock and that was their way of thinking. We thought, they had to be out of their minds. So we walked away. CG: They were thinking foreign box office and that a Black lead won’t sell to the foreign market. But this has been proven wrong in some cases? CG: Yes. When I did the sabbatical into the independent film world for 10 years and did a lot of direct to video movies, what it did was it opened the door to actually finding financiers and establishing a structure for financing a movie through foreign pre-sales. So what happened is these buyers in Spain in Japan, in Germany in all these different territories, they all come together for these festivals, like Cannes, Sundance and Toronto. They’ve represented these countries for years. It’s the same thing with these foreign buyers. You have to remember you got a 65, 75-year-old white Frenchman buying films for Paris that has to have George Clooney in them. But when I go to Paris, there are young Black guys saying, ‘[He speaks with a French accent] We love ‘Boyz n the Hood.’ How can we get that movie?’ Well, your buyer has to accept it. And I believe all over the world these stories are happening. ‘The Butler’ is at 165 million dollars in box office, foreign sales included. So was it really a black story to those people or was it that movie that everybody’s going to see? There’s no big conspiracy theory of ‘let’s keep these Negroes off the screen.’ I don’t believe that. I believe it’s just that locked mindedness that ‘hey, I gotta sell to my distributors and the distributors are asking for George Clooney movies. This is a great film, so why aren’t there a horde of reporters here today instead of just a few? CG: Because you can’t sell a secret. The thing is this movies wasn’t even supposed to have this until we said, ‘wait a minute, it’s in limited release and VOD, I don’t care. I’m still gonna let them know I’m flying into town to promote it. And sometimes that’s just how it happens. You can’t sell a freakin’ secret! If this movie came out a year from now there would be a bunch of people here because the wonderful ladies [publicists] that are setting up these interviews would have the benefit of the change that happened in 2013. In 2013 you had ‘Fruitvale Station,’ ‘The Butler,’ ‘12 Years a Slave,’ ‘Mandela’ and the list goes on. So watch, in 2014 when someone says, ‘we got this black film starring’ such and such, they will say, ‘we don’t care.’ We’re just in that transitional period of time. Is it easier to portray fictional characters or real life personas? CG: Easier for real life ones because it’s more engaging, I think. If you see inner city violence and gang incidents, I think, as a big cruise ship, the way to turn the way of that cruise ship is very gradually. Instead of looking up to celebrities as role models, there are other more ready available present role models in those communities in the form of the men in the community. Even an ex-con can make a difference if he just makes himself available to that young kid looking to do something else. I think it’s lessons like these [in ‘The Life of a King’] from that man in the community, who was working at a gas station and the men he comes in contact with, that are just as important an influence as any celebrity. I think it’s those ready and available examples of nobility in the community is what’s going to change the course of that ship. Syndicated entertainment reporter Marie Moore covers film and TV from her New York City base. Contact her at thefilmstrip@gmail.com.